Clovers don't look so pretty when you see them coming up in your lawn, but they do make a pretty bouquet for a stamped card. Here I used the Big Clover Group (BG-071-0) and Winter Queen Anne's Lace (BG-147-0) from Fred B. Mullett to great my flower bouquet. 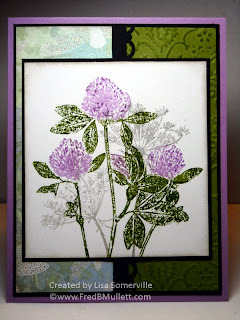 The Big Clover Group was colored with markers then stamped on Matte card stock, the Queen Anne's Lace is stamped in Sahara Sand over the Clovers. On the Olive panel I used the Damask Cuttlebug Folder highlighting the embossing (Cuttlebug Highlights Technique) with Olive ink. LOL @ Gerrie's weed comment, it's true though! Beautiful bouquet, love purple and green together! This is gorgeous!! What a stunning creation! Beautiful, I love the color combo. Lovely wild bouquet! Beautiful colors and beautiful card.